Happy Monday! Well what’s left of it. The day is done for most, and myself included. I wanted to try to fill you in on some eats lately, but be forewarned…so of my pics are pretty bad. I’ve had lighting issues I guess. I hope it’s not the operator. 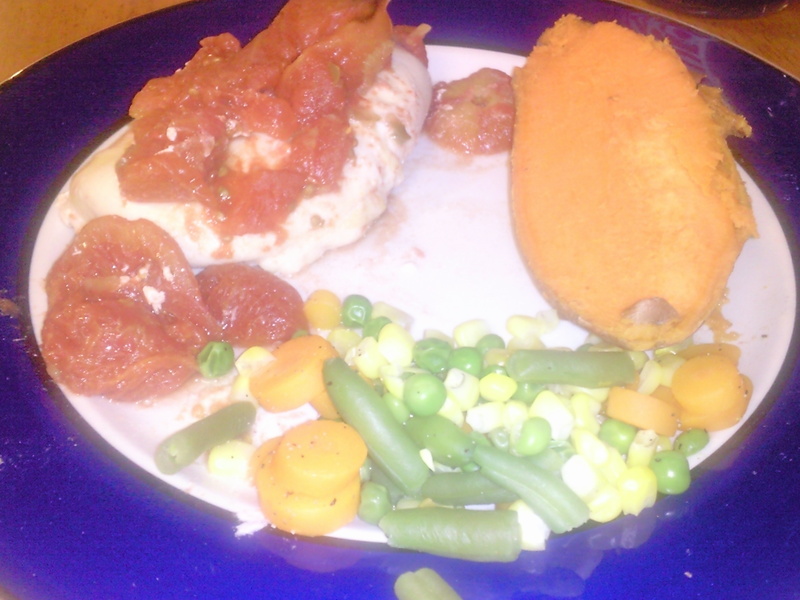 Dinner last night was baked chicken breast smothered in sliced canned tomato. A slice of sweet potato and mixed veggies. Pretty good Sunday night dinner. Check out the yogurt I just bought on Saturday. I did not notice this until I was viewing the picture I took after uploading it! I was eating this Sunday afternoon 2/28/10. The date said sell by 2/25/10! Of course it wasn’t bad, but I have a weird THING you could call it about eating foods after the sell by, use by date. Yeah, uh-huh. Icky! Oh well. Breakfast this morning did not come out looking appetising at all. 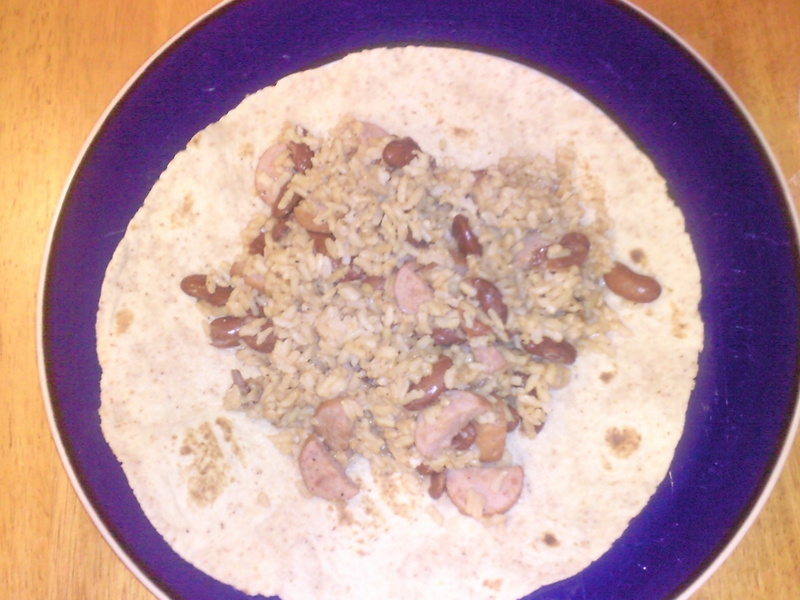 It was delish though, it just didn’t photograph well. 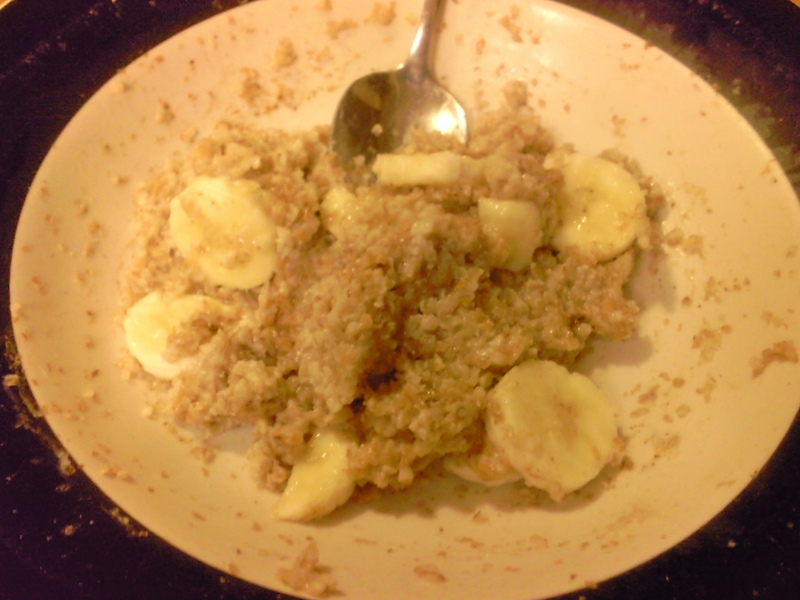 I made 1/3 cup Milled flax seed and soy hot cereal, mixed with water, and half a banana. It hit the spot! For my snack this morning I ate an unphotographed apple. Probably best considering the circumstances…bad lighting and all. Lunch today was a herbivore’s smorgasbord! 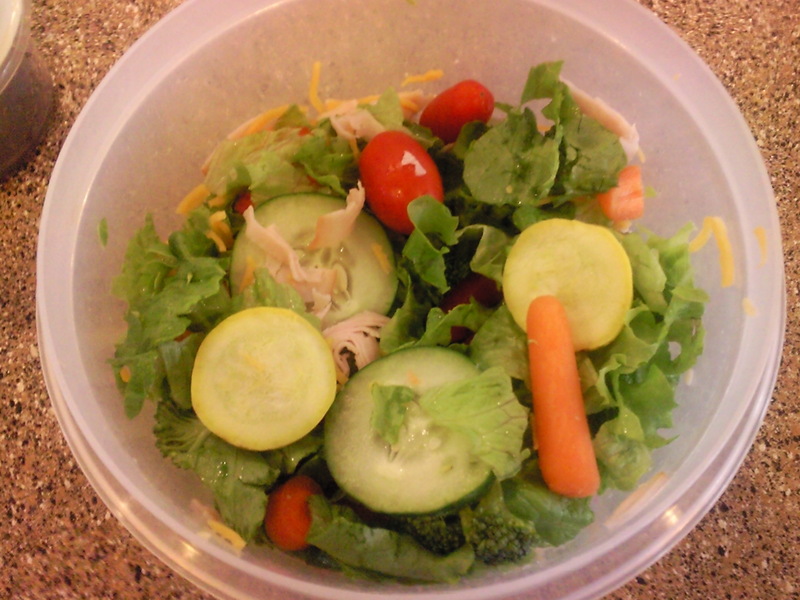 I had a HUGE salad mixed with sliced squash, cucumber, red bell pepper, baby carrot, broccoli, grape tomatoes, and green leaf lettuce. I also added in some sliced smoked turkey (sorry herbivore) and Kraft fat-free cheddar. 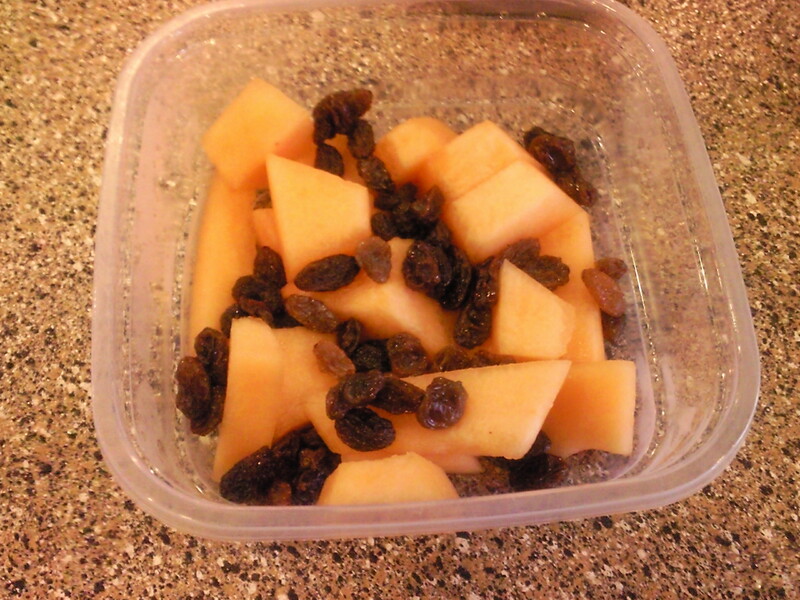 Hello Kitty container held diced cantaloupe and raisins. Yum! The salad was so big, I actually couldn’t touch the cantaloupe until later on in the day for my afternoon snack-age. So Monday nights have been exceptionally late for me lately because I’ve been taking a Parenting with Love and Logic class at my daughter’s school for the past 5 weeks. Tonight was my last night of leaving the house at 7:30 am not to arrive home until 8:30 pm! Yipee! 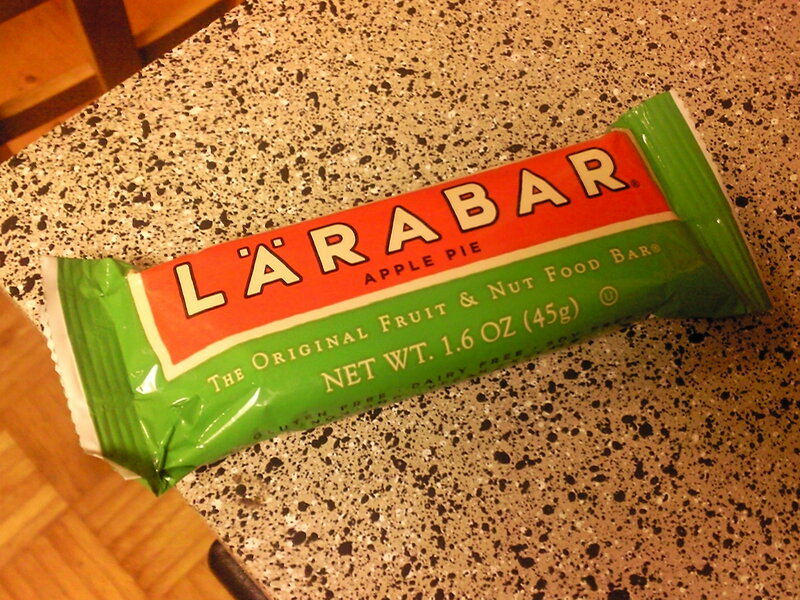 I ate an apple pie Larabar on my way to the class tonight so my stomach wouldn’t be talking louder than the instructor. It was my first Larabar. My concensus was good, but I am still out on the whole bar being satisfying thing. I can’t do it. I was still hungry just a short time later. It’s not bad in the event you are just trying to keep hunger at bay for a little while though, a temporary fix. Dinner was leftover jambalaya from Saturday. 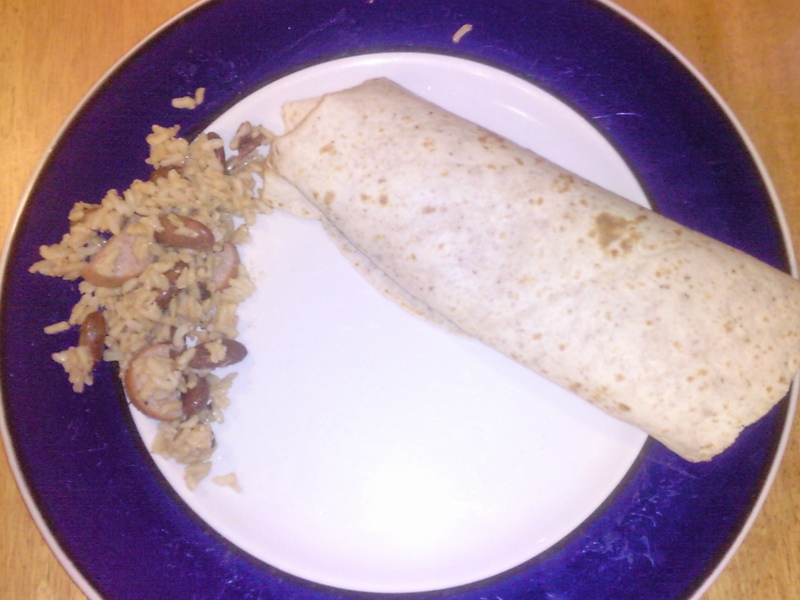 I rolled what I could into a La tortilla Factory wrap, and forked the rest. 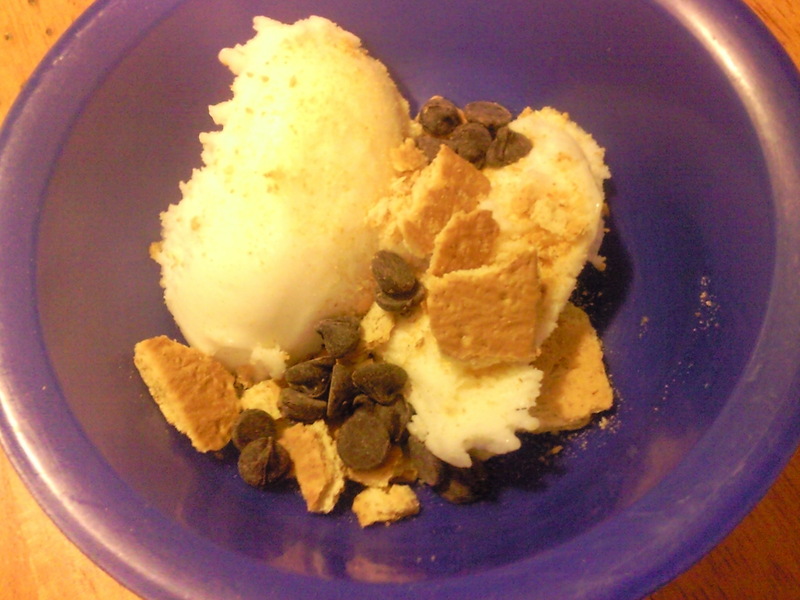 Dessert tonight was simply fat-free vanilla fro-yo with a crumbled up piece of graham cracker and a couple of chocolate chips. Sweet!! Well good night out there, my computer is trying to give up, so I’m going to let it win tonight. 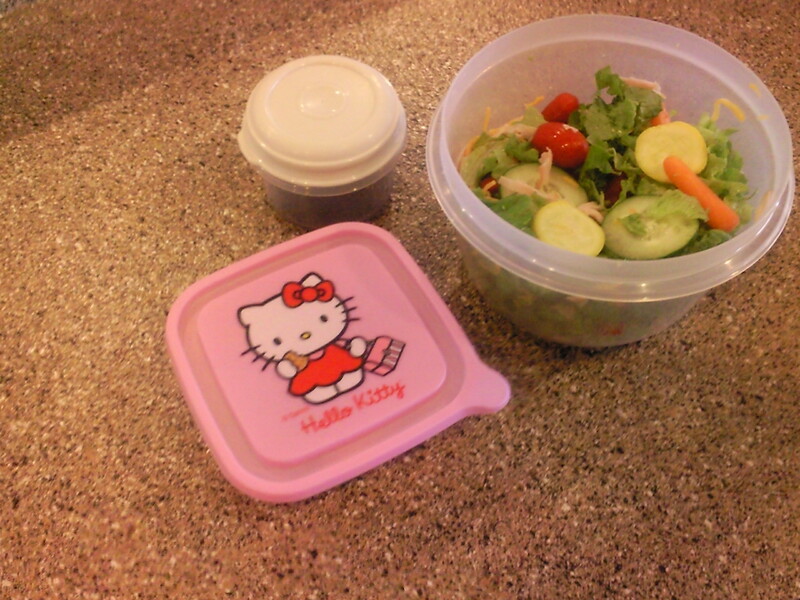 I love that Hello Kitty container! Apple Pie laras are the best! You like that? Cute huh? Always makes for a smile during the middle of the day when making your lunch. Did you like the yogurt? I picked up a plain one to try! 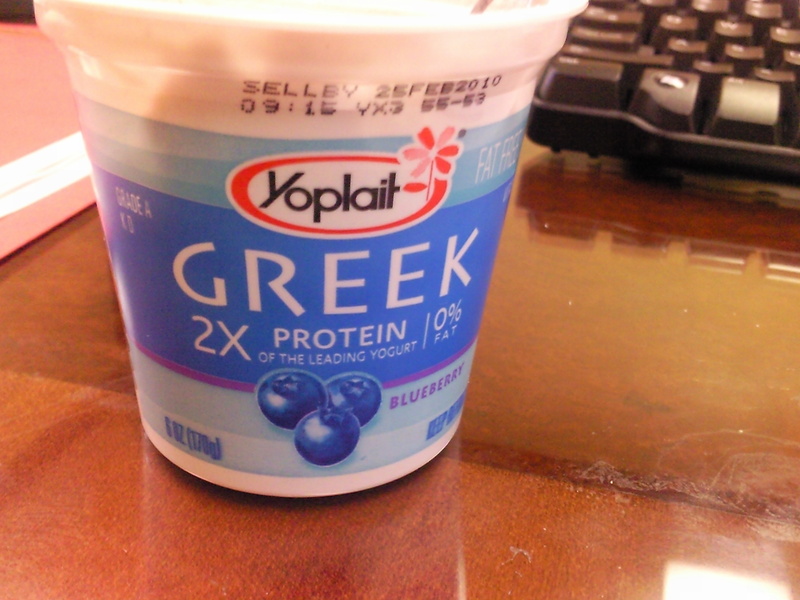 I liked it, no real fruit on the bottom or anything but a good greek yogurt for the price. I need to look for the plain next time I go.